From spider cams and new pundits to podcasts and social clips, the UK’s two biggest terrestrial broadcasters are pulling out all the stops for their shared coverage of the 2019 Six Nations Rugby Championship which starts this evening in Paris. 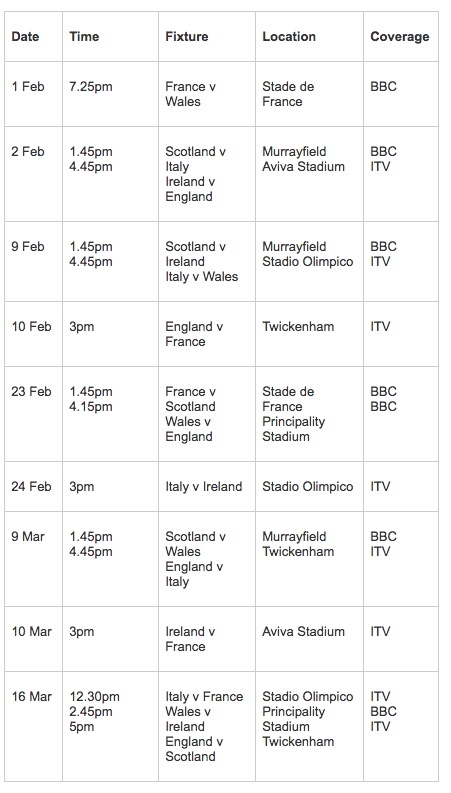 2019 marks the fourth of a six-year deal between ITV and the BBC that sees the rights for all Six Nations matches shared between both broadcasters on television and online (see table below). BBC will kick off proceedings on Friday 1 February with France against Wales in Paris while ITV’s first game is Ireland versus England on Saturday 2 February in Dublin. ITV will be keener than ever to put on a good show during the Six Nations as it has the exclusive UK rights to show the Rugby World Cup 2019 in Japan which is taking place in September. A number of technical innovations and production toys have been introduced to Six Nations coverage in recent years including ref cams, specialist lineout cameras, tracking cameras, corner post cameras and spider cams and this year’s event will use all of those again but there are no additions planned. Where there will be embellishments is in the talent pool. BBC Sport has added former British and Irish Lions and Ireland player Jamie Heaslip as well as Scotland captain John Barclay to its punditry team. 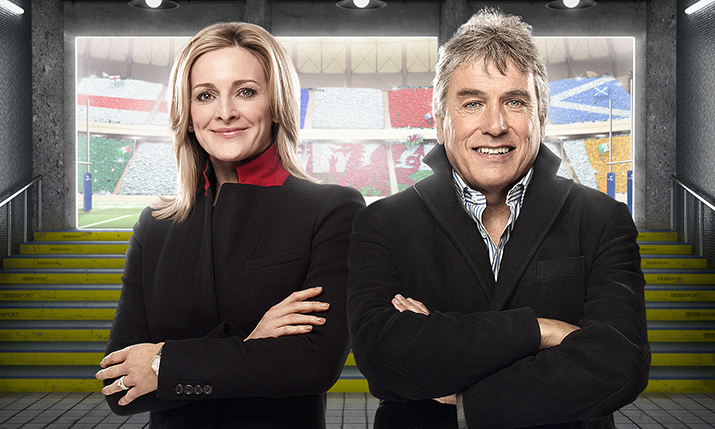 They will join former British and Irish Lions captains Martin Johnson, Sam Warburton and Paul O’Connell in the corporation’s line-up, all fronted by Gabby Logan and John Inverdale (pictured above). The BBC will also make use of such rugby luminaries as Jeremy Guscott, Jonathan Davies, Martyn Williams, Chris Paterson, Thomas Castaignede, Jake Polledri, Andy Nicol and Brian Moore. TV commentary will be provided by Eddie Butler, Andrew Cotter and Sara Orchard. Leading ITV’s team will be presenters Mark Pougatch and Jill Douglas, joined by Jonny Wilkinson and Lawrence Dallaglio, both members of England’s Rugby World Cup 2003 winning team, and their coach Sir Clive Woodward. The other ITV talent includes former Ireland captain Brian O’Driscoll, former Wales captain Gareth Thomas, former Scotland and Lions coach Sir Ian McGeechan and England Women World Cup winner Maggie Alphonsi. Former England international Ugo Monye, ex-Italian captain Marco Bortolami and former Scotland international Jim Hamilton complete the line-up. Martin Bayfield will combine presenting duties with his role as a reporter. In the ITV commentary box will be Nick Mullins, Miles Harrison and Martin Gillingham, plus co-commentators Shane Williams, Gordon D’Arcy, Ben Kay, Scott Hastings and David Flatman. Both broadcasters are adding to their TV coverage with extensive output online that includes a number of spin-offs on social and other digital platforms. The ITV Six Nations podcast returns this year, hosted by David Flatman and Tom Shanklin. The eight-episode series will include a preview of the tournament. The Six Nations is an ITV Sport production for ITV and a BBC Sport production for BBC. Coverage starts on BBC on Friday 1 February at 19:25.